THESE SHIPS ARE CURRENTLY DOCKED AROUND THE EARTH'S SUN! THE PRIMARY MISSION OF THESE LIGHT FORCES IS TO DEFLECT ENOUGH AKASHIC-GAMMA-LIGHT-DATA FROM THE CENTRAL SUN, OFF THE EARTH'S SUN, ON TOWARDS THE EARTH WHERE IT ENTERS HUMAN-BODY CELLS AND RECODES AND ENHANCES DNA TO A MORE ADVANCED STATE OF FUNCTIONALITY! WHEN YOU UPGRADE YOUR PHONE'S OPERATING SYSTEM A BACK-END PROGRAM IS EXECUTED THAT WILL SHUT OFF THE VIDEO FUNCTIONALITY OF YOUR PHONE WHEN AIMED IT AT THE SKY OR WHEN YOU ATTEMPT TO FILM CERTAIN SCENES! STARSHIP PRESENCE COVER-UP#4: SOCIAL MEDIA CENSORING OF UFO, CLOUD-SHIP, IMAGES! MANY OF THESE IMAGES WILL NOT SHOW AUTOMATICALLY NOW AND HAVE A WARNING POSTED WHERE THE IMAGE IS NORMALLY DISPLAYED THAT SAYS: "MAY CONTAIN IMAGES OF THE SKY, CLOUDS OR OUTDOORS." FACEBOOK HAS BEEN USING THIS FEATURE FOR A FEW YEARS AND IT RARELY WAS SEEN BUT NOW IT'S POPPING UP EVERY WHERE, MAINLY ON PHOTOS OF CLOUD SHIP PHOTOS! 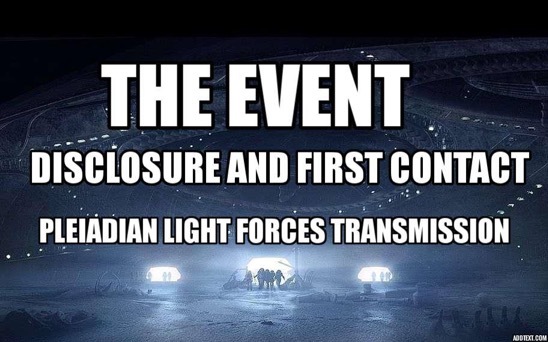 RECENT TRANSMISSIONS FROM PLEIADIAN GUIDES SAYS, "BE ASSURED, WE ARE GOING TO BLAST THROUGH EVERY MAN-MADE BARRIER THAT KEEPS US FROM CONNECTING TO AND ASSISTING THE STARSEEDS AND HUMANS ON THE SURFACE OF THE PLANET!" FURTHERMORE GUIDES SAY, "WE ARE ALREADY MAKING CONTACT WITH KEY EARTH ALLIANCE GROUND CREW MEMBERS WHO ARE LEADING THE WAY IN HELPING HUMANITY IN THEIR ASCENSION AND EVOLUTION!" SINCE 9-11-2018,YOU HAVE BEEN EXPERIENCING POWERFUL AND FREQUENT INFLUXES OF EXOTIC ENERGY ON THIS PLANET, ONE MASSIVE WAVE AFTER ANOTHER!